Most couples when they have booked their venue then need to contact their celebrant. Laws in Australia are a couple must register with the celebrant and lodge the Notice of Intended Marriage. This must be signed 1 month before the wedding takes place. My aim is to make sure that you have the ceremony you want — formal or informal, sophisticated or simple. I can give you suggestions from a range of traditional ceremonies or I can tailor an individual ceremony for you. Working together we can create one that is right for you. Based in the Yarra Valley, I can give you advice about locations - such as wineries, parks and gardens, restaurants, historic houses and function venues. Of course, you might prefer a more intimate venue, like a private home or garden. 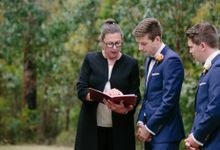 A ceremony marks and celebrates a very significant event in your life, so it is important to find the civil celebrant that you feel most comfortable and happy with. I hope that you can do this with me. Please feel free to contact me for an obligation-free meeting where we can discuss the ceremony you are planning. Every bride and groom wants their wedding ceremony to be meaningful and memorable. You and your partner will want a wedding ceremony that reflects you as a couple. I am confident that I can take you, step-by-step, through this exciting, tender and serious time in your life. You will see from my testimonials, that my clients warm to and appreciate my relaxed and friendly manner. I have sample wedding ceremonies that I can adapt to suit you. You can choose traditional or something more alternative. Perhaps you'd like a particular reading, a poem or a favourite piece of music. There are some lovely rituals we can include in your ceremony and I am happy to discuss these with you. Maybe you would like a ceremony written especially for you. You may want to include friends and family, such as children from a previous relationship. Together we can design a wonderful celebration. 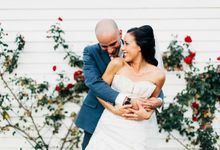 Your wedding is an intensely personal experience and above all else you need to find the marriage celebrant that you feel most comfortable with. My aim is to make you feel relaxed, confident and happy with the ceremony that we create together and that your day reflects that mood. My fee is $650 for a wedding with the first meeting taking about 1 hour and this can be done via Skype if you are overseas or interstate, once you have booked my services there is a fee of $100 and then the balance of $550 is paid 1 week before the Master Ceremony. Usually once my couples find their venue they book with me to make sure I am available. The shortest time allowed in Australia is one month. You must sign and lodge the Notice of Intended Marriage with me one month before. I provide my services from meeting and lodging the Notice of Intended Marriage, emails back and forward drafting your ceremony then a rehearsal a few days beforehand and the Master Ceremony and after the ceremony all legals are lodged in the State of the Marriage where conducted. 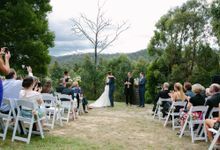 A ceremony marks and celebrates a very significant event in your life, so it is important to find the civil celebrant that you feel most comfortable and happy with. I hope that you can do this with me. 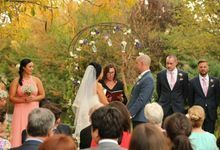 As well as wedding ceremonies, I also offer name-giving ceremonies, commitment ceremonies and renewal of vows ceremonies. 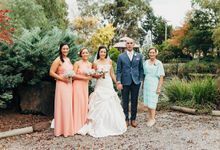 I take great pride in my work as a celebrant and I make sure that each and every ceremony is both a truly personal and professional event.